We're pulling up carpet in a new-to-us house. 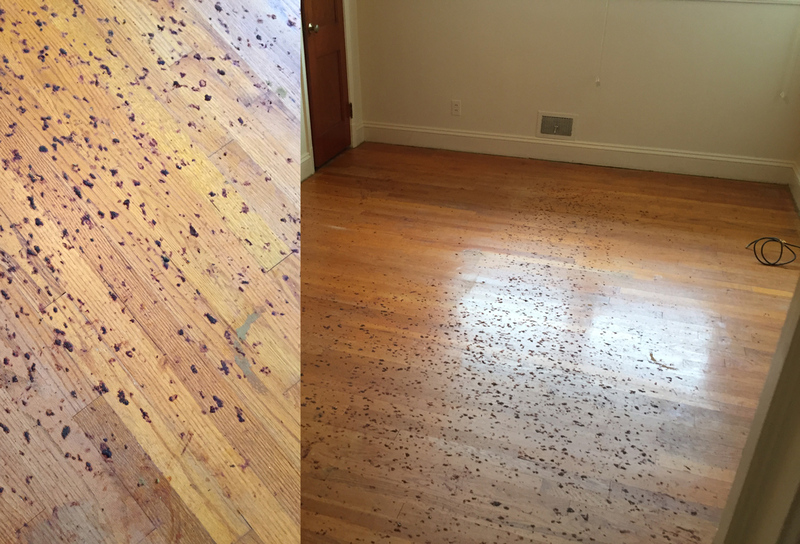 There's a beautiful hardwood floor underneath that is in great shape except that there's some red/brown sticky goop spots left behind by the carpet padding. The padding is that multi-colored stuff and it seems like the red parts have melted or something. We don't know how long the carpet has been there, but it doesn't look like it's been there more than ten years. Under the goop, the floor finish is fine. I'd love to clean this stuff off and not have to completely refinish the floors. The red stuff is still tacky. We can scrape most of it up, but it leaves behind a red film. What do you think we could use to clean this stuff up? You could try an orange oil product like Goo-Gone to try to remove the remaining sticky film. Apply directly to the spots, let sit for a short time and the use clean paper towels to wipe up the mess. Not the answer you're looking for? Browse other questions tagged flooring floor cleaning or ask your own question. How to install linoleum floor under carpet? How do I stretch carpet during reinstallation after replacing padding? How do I remove stuck (melted?) foam from under carpet on hardwood floor? Can you install grouted floor tile over padding? can this antique douglas fir floor be saved? What should I lay under carpet to protect hardwood floor for a couple of years?